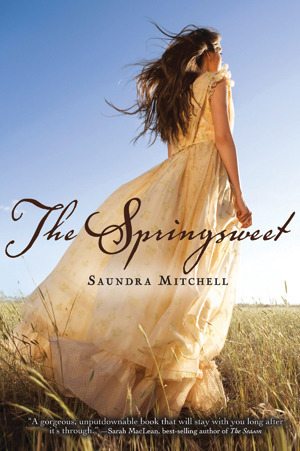 The Springsweet takes place a few months after The Vespertine ends. With most of her friends and her beau now dead, Zora feels lost and unable to move on from the tragic events that she witnessed. After she makes a shocking scene at her re-entry to the glittery world of society, her mother packs her up and sends her to live in the Oklahoma Territory until she "regains her senses". The romance in this book was interesting. I LOVED Emerson's character and was rooting for him immediately. I really had hoped to like Theo more. He made a very dashing introduction to the reader, but soon fizzled into a character that reminded me more of Ichabod Crane (remember the Disney movie?) than a dashing, well-dressed hero. He had no guts. I will leave it at that (so I am not too spoilery). I loved the characters in this book- especially Zora. She was no helpless damsel, and she really seemed like a REAL person (which is sometimes hard to achieve in historical fiction). Do yourself a favor and go read The Vespertine- and then pick up this book in April!